Two of Vermont's last nine Burr-arch bridges are found in Charlotte: The Quinlan and the Seguin. The unknown builders of the Quinlan and Seguin bridges were singularly talented individuals: Similarities in the two structures indicate that it is likely both bridges were built by the same people. Gilbert Newbury, a structural engineer trained in timber bridges, points out that very sophisticated and intricate construction details make these two the best built wooden bridges in the state. Intricate "keys," especially visible in the Seguin Bridge, are used in the tension connections in the bottom chords. The elaborate roof framing systems include "birds-mouth" notches in the rafters and beams. Also, the top chord lateral braces are set in an elliptical shape, very difficult to do, and not copied elsewhere. Newbury observes that the lateral bracing system seems to work well, the bridges being relatively straight and true. The Quinlan Bridge crosses Lewis Creek in the midst of the rolling farmland that was once the bottom of the ancient Champlain Sea. To the west, Mount Philo jags upward: Lake Champlain and the Adirondacks lie beyond. To the east, the foothills rise to the Green Mountains. The 86-foot multiple-kingpost Burr-arch bridge, built in 1849, stands beside a tall hickory tree and a farmhouse dated 1798. The bridge is named for a family that had extensive holdings in the Lewis Creek valley. 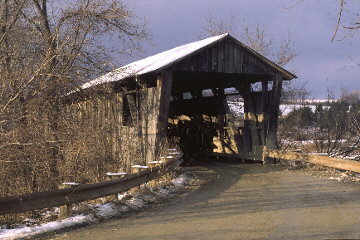 Built beside Sherman's saw mill, long gone, the span is sometimes referred to as the Sherman Bridge. The span has been strengthened with two steel beams installed under the existing floor system, probably in 1949 or 1950. The original stone abutments have been capped and faced with concrete. To find the Quinlan, turn left off Route 7 onto Hollow Road in North Ferrisburgh. The turn is marked by Jimmo's Store opposite. Take the first left, Spear Street Extension, then bear right at a fork in the road. Drive about 2.3 miles to the bridge. To visit the Seguin Bridge, drive through the Quinlan Bridge and turn left on Creek Road. Continue until the road ends at the intersection of Rosco Road. Turn left and drive about three miles to the bridge. Look for the waterfalls upstream. The countryside here is mixed heavy second-growth woods and abandoned pasture and crop land. Go slow: The road is a curvy one. Seventy feet long, the Seguin, like the Quinlan, was built in 1849 to cross Lewis Creek. The portals are decorated with simple pilasters. Repairs were performed in 1949, leaving the bridge unaltered from the original builder's plan. Authentic repair work was done again in the fall of 1994 by Paul Ide and Jan Lewandoski. The work included replacement of portions of the bottom chords, several vertical posts, and a set of bearing blocks. If you want to read more about Charlotte and its bridges, check out Richard Sanders Allen's Covered Bridges of the Northeast, and Around The Mountains, by the Charlotte Historical Society. Theodore Burr built a bridge across the Hudson River in Waterford, New York in 1804. There, he used a combination truss and segmented arch that became the basis of his 1817 patent. The patented truss consisted of parallel chords tied together by vertical posts and stiffened by crossed braces. Each timber-arch segment, lap-jointed on both ends, is fitted into the next on both sides of the posts and braces. The segments are "through-bolted" to the vertical posts, sandwiching the truss. The ends of the arches are received by the abutments below the bed timbers. The Vermont versions, except for the bridge serving the Shelburne Museum, differ from Burr's patent in that the ends of the arch are supported by the ends of the lower chords rather that at the faces of the abutments. Also, a multiple-kingpost truss is used rather than the cross-braced truss. The Burr truss is not a true arch-bridge in that the parallel-chord truss system and the arch act in concert to support the bridge and its load. The multiple-kingpost truss serves the purpose of aligning the arch segments while carrying the road-bed. The arch serves to make the whole structure more rigid, and the combination is capable of longer spans than is the multiple-kingpost truss alone. The Burr-type bridge is best classed as an auxiliary arch system. In a true arch bridge, the roadway is supported only by the arch. How the Burr truss actually works is "a thorny topic of debate," according to Gilbert Newbury, an engineer with the Vermont Agency of Transportation. Newbury, who is trained in timber engineering, planned the repair of the Burr-arch bridge on Gates Farm in Cambridge. He explains that one school of thought has it that the arches do the work, the other believes it is the parallel chord truss. Newbury's computer analysis and field observation indicate that it is the truss that carries the majority of the bridge and roadbed weight, with the plank arch acting as a stiffening element for the truss.